This kit includes everything you need for the upcoming workshop with instructor Vanessa Lacy. The supplies in this kit would be more than a $100 value if you were to purchase them on your own, but some supplies like brushes and palette knives were bought in bulk by the instructor and some supplies like the oil and Gamsol were purchased in large containers then distributed into repurposed, sealable, glass jars for students use. 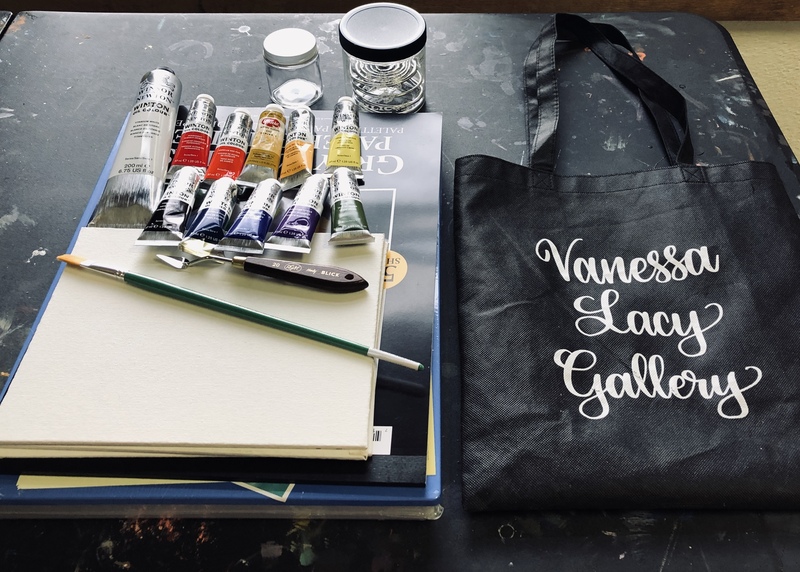 If you purchase this kit you get your supplies at a discount, you save time and hassle at the art store, and you can show up to the first class knowing you will not be missing any supplies or have bought the wrong color in error. -"Gray Matters" disposable palette paper with sealable palette container to allow you to travel with your palette without worrying about ruining your car's interior. Vanessa has two of these and they are essential for outdoor painting and for the studio. - All paint tubes needed for a limited palette workshop.